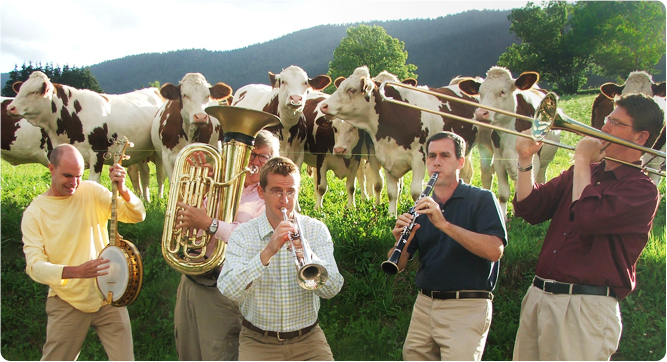 French cows have a thing for jazz, especially when it's played by the New Hot 5, an ensemble featuring BYU professors and former students. A video of them playing in the French countryside has surpassed 1 million views. BYU a cappella group Vocal Point is lighting up the stage in NBC's The Sing-Off. How far will they make it? Watch The Sing-Off Mondays at 7 p.m.
BYU greats like Steve Young and Jimmer Fredette tell a real cougar how to be a real Cougar in a BYU promo that airs on ESPN. Watch the new "flea flicker" version. BYU editing students competed against professionals and won two national awards for their winter 2011 issue of Stowaway, a student-produced travel magazine. Dorothy and friends had a pity party in Oz until they learned a simple truth. Watch a BYU Alumni webcast to find the answer to their problems—and maybe yours. Are members of Congress more likely to use Twitter if they are behind in the polls? See what BYU research says. Christine Durham, chief justice of Utah's Supreme Court, spoke on the influence of state constitutions. A team of BYU grad students narrowly missed the winning round in a spelling bee fund-raiser to support Project Read. German major Tessa Lush received a Congress-Bundestag Youth Exchange fellowship to study in Germany for one year. Alum Steve Carlston will take over as president and general manager KNBC in Los Angeles. In October BYU will perform two of Gian Carlo Menotti's operas, one with an extraterrestrial encounter. BYU students are bringing Newbery Honor book The Hundred Dresses to the stage—and donating 100 dresses. Acupuncture and herbal treatments were an unexpected part of nursing students' experience in Taiwan. A hands-on course has nursing students providing treatment to at-risk populations, including inmates at Utah prisons. Once again, a BYU student is on the National Student Nurses Association board: get to know Jaclyn Coleman. Nari Carter, a mother of three, became the first graduate of the McKay School's newest PhD program. A professor is helping his first-year grad students get published in one of the most-read journals in their field. Professor Tim Smith is one of only six BYU faculty to date to become a fellow of the American Psychological Association. With a nomination from President Obama, alum David Harris was promoted to brigadier general in the Air Force. Civil engineering professor Richard Balling received the King and Diane Husein Professorship for 2011–13. Alum Eric Hunter analyzed the voice of President Gordon B. Hinckley to research health and aging. While other universities have seen a decline in math majors, BYU has seen a significant increase. Find out why. When it comes to teaching, geology professor Randy Skinner uses humor and dinosaurs to engage his students. Hacking could land you in jail, but a team of BYU students were able to legally test their hacking skills in competition—and win. Monroe McKay, a U.S. Circuit Court of Appeals judge, spoke at the Law School's 2011 Founders Day dinner. Third-year student Camille Borg received a national award for 300 hours of volunteer work at Mosaic Family Services. A Carnegie Endowment for International Peace vice president will speak at BYU on Oct. 12. Robert Viscusi, Broeklundian Professor of English at City University of New York, will discuss Italy's globalization on Oct. 27. BYU held the no. 3 spot in the latest U.S. News accounting-program rankings. The Marriott School ranked 36th overall. The new associate director of BYU's MBA program is accounting professor Monte Swain. The Princeton Review ranked the BYU Rollins Center for Entrepreneurship and Technology graduate program no. 2, up two spots from last year. It's a site many students turn to when picking their professors, and now RateMyProfessors.com has returned the love, naming BYU the top college. The popular Pendulum Court Café, run entirely by dietetics students, is back in business. Check out the menu. According to the U.S. Department of Defense, BYU grad Josh LeMonte is worth a $350,000 scholarship and a five-year job contract. Studying 50 years of Billboard Top 100 hits, two health science professors found an unsettling rise in sexual lyrics. Read more in the Deseret News. A new compilation of stories and essays captures "the place which God prepared." Watch the story of the King James Bible in a new miniseries premiering Oct. 16 on BYUtv. The biggest names in BYU football share favorite memories from on and off the field. See what Jesse and Amanda Knight Society members got an inside look at—and join them.